The Toyota Corolla is the perfect sedan for Georgia drivers. This compact vehicle delivers all the efficiency that you could want along with the space that you really need. You’ll love the Corolla’s sporty style, comfortable interior, and advanced technology. You also know that Toyota vehicles are built to last. Come into Thomasville Toyota to view our extensive inventory of new and used Toyota Corollas! The 2019 Toyota Corolla continues to offer all the features you love. It comes in six separate trim levels: L, LE, LE Eco, SE, XSE, and XLE. The base L provides a 6.1-inch touchscreen, LED headlights, automatic high beams, a six-speaker audio system, forward collision warning, a USB port, adaptive cruise control, automatic emergency braking, lane departure warning, **Bluetooth®, a CD player, and more. The LE trim level gains 16-inch steel wheels, automatic climate control, variable intermittent wipers, keyless entry, upgraded upholstery, and a rear armrest. The LE Eco offers a different engine, special 15-inch wheels, enhanced aerodynamics, improved fuel efficiency, and different suspension tuning. The XLE provides a sunroof, bumper-mounted LED daytime running lights, 16-inch alloy wheels, HD radio, satellite radio, LED taillights, a 7-inch touchscreen, an app-based navigation system, heated front seats, and more. The SE comes with 17-inch alloy wheels, a rear spoiler, a leather-wrapped steering wheel, and SofTex upholstery. The top trim, the XSE, offers paddle shifters, heated front seats, a power driver’s seat, and full SofTex upholstery. With all of these features, you and your friends are certain to have a great trip in the 2019 Corolla! L: The value priced model in the 2019 Corolla lineup comes standard with Bluetooth connectivity*, USB port, Toyota Safety Sense P, 1.8L 4-cylinder engine and many other features. LE: The next option on the trim ladder that builds off the L’s features, yet also includes 6.1-inch touchscreen, integrated backup camera, remote keyless entry, and automatic climate control. LE Eco: The LE, but with a slightly enhanced 1.8L 4-cylinder engine under the hood for increased fuel efficiency. SE: The sportier version of the 2019 Corolla that comes standard with gloss black, mesh pattern grille, rear spoiler, and 17-inch machined alloy wheels with black painted accents among other notable features. XLE: If the best interior features are on your “must-have” list, the XLE trim is the right choice for you. You’ll enjoy amenities like power tilt/slide moonroof, Entune™ Audio Plus with Connected Navigation App, and Driver/Front Passenger heated seats. XSE: The perfect blend of sport and luxury. Includes all the best features of the lower trim levels plus SofTex® trimmed seats, 8-way power adjustable driver’s seat, and Smart Key System. As implied by the name of the 2017 model’s 50th Anniversary Special Edition trim, the Corolla has now been around for 50 years. During that time, it has passed through numerous generations, typically getting larger and having more features added. In 1993, the Corolla got big enough to make the transition from the subcompact to the compact segment. It was offered as a wagon or sedan until 1997, and antilock brakes were available on all models. In 1998, the Corolla again got larger, but it also got lighter, partially due to new engines made entirely of aluminum. Horsepower and fuel economy also increased. A new generation arrived in 2003 while 2009 brought in the tenth generation with four trims and optional features like navigation and keyless start. The Corolla’s current eleventh generation began in 2014 with styling adjustments and updates to the CVT. Drivers and passengers love that even though the Corolla is a smaller sedan, there is plenty of legroom for both passengers and driver. 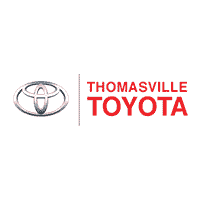 For a better feel of what it is like to drive one, come over to Thomasville Toyota in Thomasville, GA. Our experienced team can guide you through the different models and various trims, answering any questions you may have. We are happy to provide competitive financing, as well as certified mechanics for all your vehicle needs. Call or pay us a visit to learn more! **Bluetooth® word mark and logos are registered trademarks owned by Bluetooth SIG, Inc. and any use of such marks by Toyota is under license. A compatible Bluetooth®-enabled phone must first be paired. Phone performance depends on software, coverage and carrier.